Do you want to weave in the air of autumn and to feel its coolness? Do you want to take advantage of this beautiful season and gallop on high streets and back lanes? I am sure you do as long as you have deep love for the life. If you have a travel transport that offers you comfortable riding experience and excellent music quality, you will never sit still anymore. Such a travel transport is just beside you and it is named Fosjoas V9 two-wheeled balancing scooter. It will let you love autumn more. The appearance is enough to attract you. 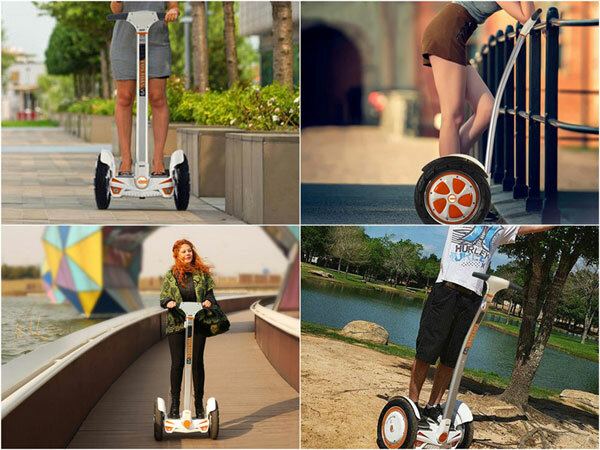 The sleek hand feel, high-quality material and fashionable figure make Fosjoas V9 self-balancing scooter one of big stars in intelligent electric scooter sector. When it comes to the internal of Fosjoas V9 two-wheeled self-balancing scooter, it is more powerful. The built-in intelligent chip is fine-tuned for instantaneous and intuitive control. On the basis of fuzzy algorithm, aviation altitude control technique and gyroscope system, Fosjoas V9 2-wheeled electric scooter can keep balanced by itself. That is to say, you can control it by adjusting your body gravity. Briefly speaking, if you incline your body forward, it will move forward and speed up. On the contrary, it will brake or slow down if you lean backward. The equipped 4-inch wide display panel can monitor the real-time data, such as riding speed, temperature and battery level. The adopted closed stereo of Fosjoas V9 two wheel electric scooter is worth to mention. It offers high music quality. You can enjoy your loved songs whenever and wherever. This closed stereo can be connected with your phone via Bluetooth. Then, you can download nice songs during your journey. Imagine you ride V9 and weave in autumn air. At the same time, you listen to you icon’s album. That will be an great experience.